The ZyXEL NWA1120 Series is a standard-based, SNMP-managed PoE Access Point (AP) that includes two models: the 2.4 GHz NWA1121-NI and the newly introduced NWA1123-AC featuring the advanced 802.11ac technology. The smoke detector look exterior makes the NWA1120 Series perfect for indoor ceiling-mount installation; with the optimized antennas built-in, its design solves the common interference issue in ceiling-mount deployments. The NWA1120 Series supports multiple operating modes, such as wireless client and repeater, which make it an ideal, flexible solution for small business, hotels and school nvironments. Different from traditional business wireless APs struggling between performance and environment cohesion, the ZyXEL NWA1120 Series of PoE AP features embedded antennas and ceiling-mount capability without sacrificing wireless performance. In typical ceiling-mount installations, the access points with external antennas are mostly hidden in the plenum area; to prevent performance degradation, the antennas usually stick out of the ceiling—messy for indoor deployments. 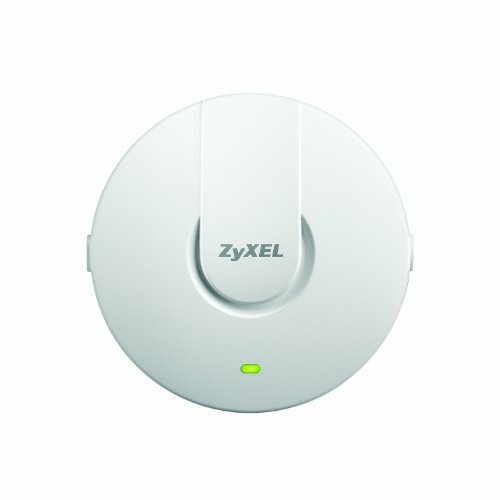 The smoke detector-style exterior of ZyXEL NWA1120 Series is suitable for ceiling installation that prevents equipment theft. Although the NWA1120 Series uses built-in antennas, it outperforms APs with internal antennas and blends into the interior better as well. In addition, the ZyXEL NWA1120 Series adopts non-toxic casing material, since it’s usually placed in plenum areas, to prevent hazardous vapor emission in case of fire; this is especially important to public venues such as offices, hotels and schools. It’s now common for a user to carry two or more devices that use different Wi-Fi bands; this challenges many places that still use legacy Wi-Fi AP with insufficient capability to serve the high-bandwidth devices. NWA1123-AC is compatible with concurrent 2.4 GHz and 5 GHz Wi-Fi bands to support more users at the same time. Featuring the latest IEEE 802.11ac technology, including the expanded channel binding of 80 MHz and the highest 256 QAM (Quadrature Amplitude Modulation), the new NWA1123-AC delivers data speeds of up to 3 times faster. This brings the best user experience through higher number of parallel video data streams for minimized latency on the network.